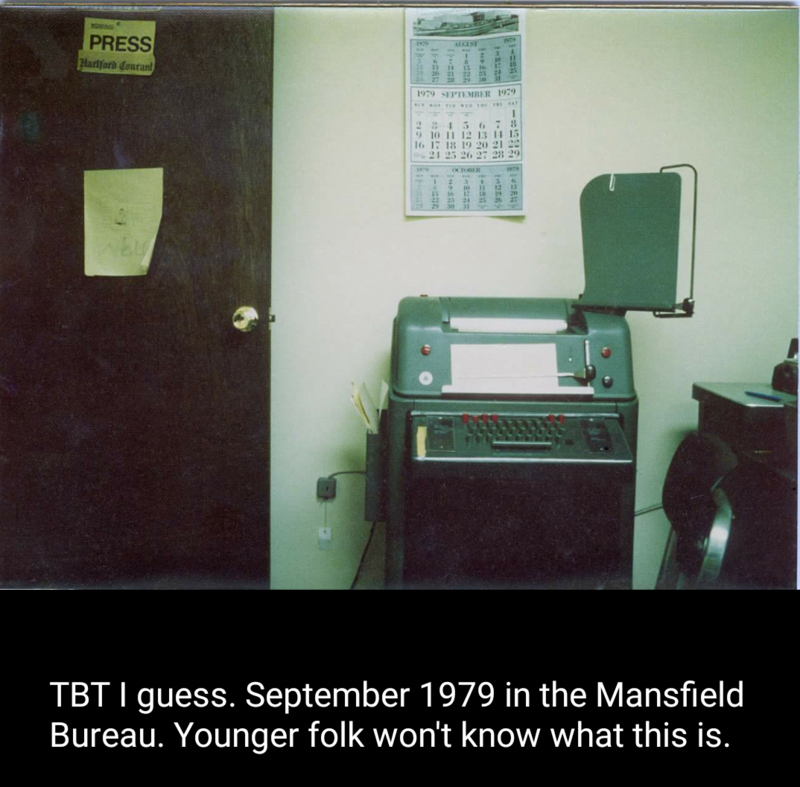 This started as technostalgia and finally got me to write something I’ve been trying to get around to for a week… On Facebook, Kathryn Lord, a former Hartford Courant colleague posted this photo of our former Mansfield (Storrs) bureau teletype machine — just before it was replaced by a 1979 computer and modem. I believe the sign on the door is an old University of Connecticut press parking pass that I had stuck there under a Hartford Courant nameplate ripped from a front page a half-dozen years earlier. While the sign and teletype remained in 1979, I had moved on from being UConn-area bureau chief to be higher education editor in Hartford in ’75, and by ’79 had started the grad school program that led to my leaving the paper in 1980. But I was already riding a wave of memories about that office and the people in it — one in particular — when this picture appeared in the Hartford Courant “alumni” Facebook group. So I asked Kathryn for permission to repost it outside the members-only space. About a third of my Courant career traveled over that very teletype, from 1971 to ’75, stories I wrote or edited, never thinking that I was part of the last wave of analog communication technology. This was no digital computer and modem operation. The machine had no storage — it sent one character at a time, uppercase only, to a corresponding machine in Hartford. Push down a tall mechanical key and it would simultaneously type a letter on the yellow roll of paper in front of you and signal a similar machine to type an identical letter at the other end of a leased telephone line — where the Hartford Courant state desk crew was busily laying out pages, writing headlines marking up the printout so the composing room could set it in type in proper upper and lower case. And last week I learned that the first full-time reporter I was able to hire to share that office has passed away, after a remarkable journalism career that never ended. Terese A. Karmel, known to everyone (sometimes confusingly) as T.C., started as a small town correspondent, a mom with two kids at home, somehow finding time to cover school board and planning and zoning meetings, being paid a pittance per story, but in love with writing. She soon became a part-time reporter-editor, then full-time staff, and eventually took over my old job as bureau chief. But she kept going, building a career as a feature editor, sports writer, magazine writer and journalism teacher. She started writing about women at the University of Connecticut just as the women’s movement and Title IX arrived, empowering women’s sports. She paid attention when others didn’t. She shared an amazing amount of passion, ideas, humor and energy, both in print and in person. As her first editor, I mostly just got out of the way. That teletype machine — and print — ultimately saw many more stories with her byline than mine. I am proud to have known and worked with her, and very sad that she is gone. Of course someone at the Courant has written the more complete obituary, one that doesn’t “bury the lede” the way this little memorial does. I found out yesterday that I have lost a friend, just an acquaintance really, but someone whose interests and mine overlapped in this new ethereal world of social media and online research. Jimbo should have become obsessed with at least the title of the old TV show “I Led Three Lives,” because the Web, online forums, blogs and podcasts certainly made it possible for him to lead many more than that. His biggest obsession in recent years was a decades old radio show called Vic & Sade, a brief quirky daily serial that might be considered a Depression-era Midwestern Seinfeld if those weren’t complete contradictions in terms. His Vic & Sade blog was one of more than a dozen websites he created with the Blogger program, stretching it to its limits, but he also has had a career in podcasting on more general subjects. He recorded a 13-chapter online “audiobook” about Vic & Sade with a wonderfully modest introduction that mentioned how relatively new he was to the oldtime radio hobby, that he was in poor health, and that he had lost his wife in an auto accident some years ago. The Audiobook that Choked Billy Patterson. Someone on Twitter posted a link yesterday to what they said was Jimbo’s obituary under his real name. It is a blank except for the name, date and town he lived in, with no funeral arrangements mentioned. Did his family there near the Georgia coast really have no bio to post, and no idea of his lives online? Was his use of the names “Jimbo” and “Jim/Jimbo/James Mason” based on a real need for privacy? Were there other names he used for Old Time Radio Researchers Group OTRRG uploads at archive.org? He mentioned once that folks confused him and OTRRG’s Jim Beshires because of the first name and initial. I “met” Jimbo on Twitter, where he posted as http://twitter.com/jimbo_otr (his last posts there were Nov.30) … At the time I was looking for help in my research into old radio show portrayals of journalists. I used to be one, and later was a journalism professor, but his research was purely a labor of love, with as far as I know no goal of making money, selling a commercial book, or getting some arcane credit toward tenure and promotion, which had been part of my own motivation for researching old radio shows. Our Twitter and email conversations led to his interviewing me about my OTR research. He published the results on one of his blogs in 2012. Coincidentally, both of us had been exploring the research potential of Google’s scanned-newspaper project. After Jimbo interviewed me about my work, we tagged each other back and forth on Twitter for a couple of years. But since retiring, I’ve been devoting more time to music and less to radio research, more time to Facebook and less to Twitter. As a result, I pretty much completely lost touch with him. I’m terribly sad to hear that he has passed, and to hear the wheezing sound of his voice on a couple of podcasts I’ve listened to since getting the news. I had downloaded his Vic & Sade audio book, but had only listened to part if it, and had no idea how extensive his audio work had been. For almost a year he had hosted something called Overnightscape Central, as well as his Vic and Sadecast, both of which his friends plan to continue. Some of his collaborators there built a collective tribute broadcast that is almost four and a half hours long. He touched people! Well, all I can say is that I hope Jimbo had as much fun and fascination — and love — in all of the parts of his life that apparently few of us knew anything about. Rest in peace, Jimbo, and in this strange new kind of internet ethereal immortality. A “Superhuman” effort at combining all the 15-minute episodes of the 1940s Superman radio serial into “complete story arc” mp3 files… cutting down the repetitious reloading and commercial interruptions for those whose “research” interests involve listening to the full stories. (There are other Archive collections and Web pages with individual episodes in date-sequence.) To give you an idea of Jimbo’s commitment to the Old Time Radio “hobby,” there are 80 stories here, ranging from one to six hours long! Dec. 21 addition… I finally got to hear Jimbo’s podcasting friends pay their respects — with more than four and a half hours of memories, excerpts from his broadcast, and other tributes! It’s not “like public radio,” “like talk radio,” or like anything I’ve been listening to elsewhere. Unfortunately, it was his death that made me finally give a listen to this aspect of his online career. I had only listened to a few episodes of Jimbo’s Vic & Sade audiobook, and had no idea how far beyond that one podcast his podcasting career went, and now I am just a little fascinated by the non-OTR online community podcasting made him part of. I’ve just spent the morning finally listening to his fellow-podcasters’ memorial program… almost four and a half hours of tributes and clips from his past programs! And that is only part one! Quite the memorial. His death also prompted me to dust off this general purpose blog that I haven’t been using as much since retirement, and since getting over-involved with Facebook. I have been letting this blog fade rather significantly since my retirement from teaching journalism, but a friend’s post on Facebook about the closing down of the Roanoke Times presses inspired me to write something kind of long for a Facebook post and relevant to the original theme of this blog, so here it is. “Hot off the presses” can’t mean the same when the presses aren’t in the same city as the name on the front page of that newspaper… and the newspaper as an institution isn’t as great a representative of the community when it doesn’t employ the full range of production people, not just writers and editors and photographers and designers and ad takers, but typesetters and compositors and printers and press operators and forklift drivers (for those big rolls of paper!) and truck drivers and delivery folks, circulation supervisors, what we used to call paperboys and newsstand operators… the whole crew that used to create a daily miracle in newsprint. See the pressman story that Roanoke Times veteran Beth Macy shares below (https://m.facebook.com/story.php?story_fbid=10155673584327835&id=586837834). No amount of corporate public relations staff can replace having dozens of employees who care about their jobs and represent the newspaper in the community. Times are changing. “Papers” are digital. But it takes a mighty stretch for web comments, Twitter tweets and Facebook page discussions to make your local news organization as much a part of the community as it was when it employed so many people in the community in so many trades. I’m thinking of a short-lived Mickey Rooney radio series in which he played an Army vet newspaper-truck driver whose father had been a typesetter, and whose life goal was to be a reporter. For most of the 20th century, you had respect for the newspaper as a local institution, whether you agreed with his editorials or not, because you knew somebody who worked there or whose father or mother or brother or sister worked there. Packing up the presses and selling them for scrap or to some distant location where they still put ink on paper is in some ways just a sign of the times, but in other ways a sign of losing a “hot off the presses” community institution and local employer, taking over by a big out-of-town Corporation, cold and distant, not caring in much other than its bottom line. Anybody else catch the bits and pieces of “A view from Appalachia” on NPR Morning Edition today? I wasn’t up early enough for the 7:15 live Facebook chat, but will post a link to the replay. Steve Inskeep co-anchored from a Knoxville restaurant, had interviews with the city’s mayor and a Berea College Appalachian Studies prof, plus a pre-recorded story segment from a Bristol (Va./Tenn.) pawn shop, and others with Tennessee’s governor, with a former Kentucky coal-miner who now makes Dixie Cups, with the promoter of the Bonnaroo music festival, with some folks trying to build new businesses in mountain communities like Damascus, Va., and with an unwed mother (also in Kentucky) who hopes joining the military will lead to a career in law enforcement, but not in her meth-afflicted hometown. Music by Knoxville’s Black Lillies, and R.B. Morris. Placeholder Web pages were posted at 5 a.m., and by afternoon had streaming audio players. Eventually transcriptions were added. All in all, it was an impressive commitment to making ambitious use of many available online media tools. Shuffling together the geological “Appalachia” (including mountains as far as New York) with the cultural, historic and economic Southern Appalachian region in an overview probably didn’t help matters. But I was most disappointed that West Virginia Public Radio wasn’t involved, rather than Knoxville, which was a bridge to Tennessee’s governor for an only loosely related interview story. 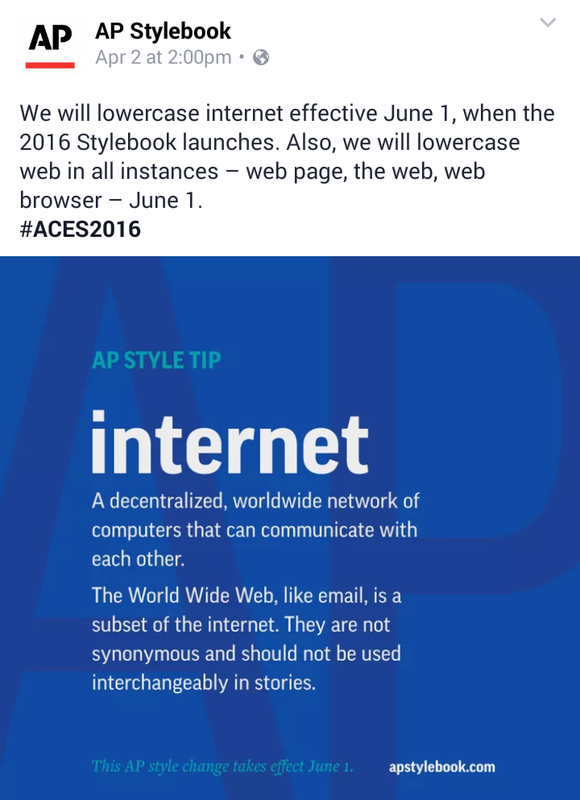 The Associated Press has announced that on June 1 its AP Stylebook will cease capitalizing Internet and Web. The news on Facebook looked like this, with a good reminder that the internet and the web are not the same thing, capitalized or not. Beyond that reminder, the style news has me feeling like a cyber curmudgeon, set in my ways after almost 40 years of using computer communication services. As a shortened form of the proper noun World Wide Web, “the Web” uppercase made sense to me when referring to the collection of computer services set in motion by Tim Berners-Lee in the early 1990s. AP and the public had gotten inconsistent about “Web,” website, webmaster and other compound uses. Part of the problem is the sheer size of that capital W in most typefaces. A technical article risked poking the reader in the eye with all those tall barbs. So I understand the need to sacrifice the big W for typographical aesthetics and consistency. I still like the somewhat geeky distinction between “an” internet — two or more connected networks — and “the” uppercase Internet, the ever-expanding decentralized global network… I think of it as a physical entity — all those wires, cables, wireless links, switches, routers and computers, as well as the rules (protocols) that make them work together. The i/I distinction is admittedly confusing. The big Internet could use a name of its own. I would suggest FRED, and let someone else reverse engineer the acronym, but that friendly name already has other uses, some involving “the F-word.” Perhaps “the Net” could the replacement. Or… another comparison just came to mind. Does “the ocean” suggest to you all of the oceans of the world? The individual oceans get their proper names, uppercase, while the network of all of them flowing into each other is referred to in lower case as the ocean or the oceans. But, no, let’s not start saying “the internets.” That sounds like a line from a stand-up comedian. Meanwhile, I disagree with AP’s reference to the World Wide Web” and “email” as “subsets” of the network. They are software-powered services run on the network — programs and data in motion over all those cables and wireless links, following another layer of protocols. “Subsets” of the Internet sounds more like some part of the physical wiring, rather than the electronic reality of bits and bytes flitting about wirelessly to take shape as pixels on our screens. Note: After I posted a short note about this on Facebook, a friend (Dave Winer of http://scripting.com) asked me to put it on my blog so that he could point people to it more easily. This rather long draft was composed on a cell phone late at night, risking both eyestrain and auto-correct errors. Alas, I’m afraid verbosity has struck, and I have no editing help — other than your comments on this blog post. It took about four tries to get my successor as primary editor of the site logged in. Apparently the email system at the university where he teaches was blocking the login invitations. As “editor emeritus” I’m hoping a new editor or two can develop a close working relationship with the officers of the group, attend more of its events (which I hadn’t been able to do for years), and get the division to live up to the “and online news” phrase its membership added to the former “Newspaper Division” name some years ago. Meanwhile, I see a little post-convention activity at the division’s Facebook page, our third attempt at getting members interested in communicating through Facebook… But if current officers are Facebook users and shy about WordPress, maybe Facebook will grow to be part of the division’s new-media direction. I hope my successor as editor can repost things to the “open Web” for any division members who still insist the “walled garden” of Facebook is the enemy, or something. As the U.S.A. reopens a Havana embassy, and Puerto Rico struggles with financial problems, perhaps it’s time to look back at a century of history — and the news media’s sometimes multimedia role in setting agendas that people might, in this case literally, march to. 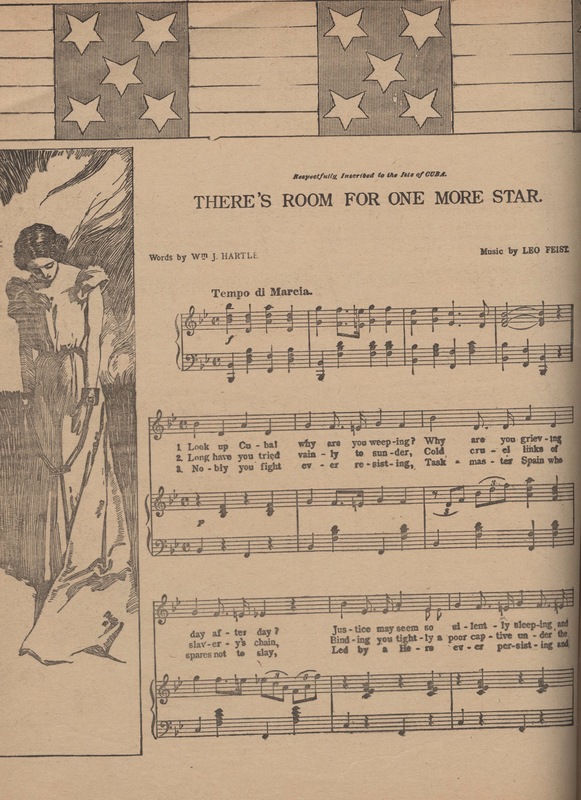 I found a copy of this song in an antique shop’s paper ephemera bin long ago and for years toyed with the idea of searching the archives of William Randolph Hearst’s New York Journal to see just how extensive the newspaper’s “musical supplement”-publishing endeavor was, and whether it was confined to cheerleading America into war with Spain. I assume this sheet music was bundled in with the other Sunday color supplements, although I suppose it might have been sold separately. Now, having decided I’m better suited to retirement than to university-funded academic research, I’ll just toss the idea out here for others to consider. The New York Journal‘s “morgue” files of clippings and photos are — go figure — at the University of Texas, as I discovered just in time for a freeze on my then-university’s travel funds. Oh well. Of course the New York Public Library, Library of Congress and other institutions may have relevant material too. Look up, Cuba, why are you weeping? Why are you grieving day after day? Justice must seem so silently sleeping and turn a deaf ear unto you when you pray. 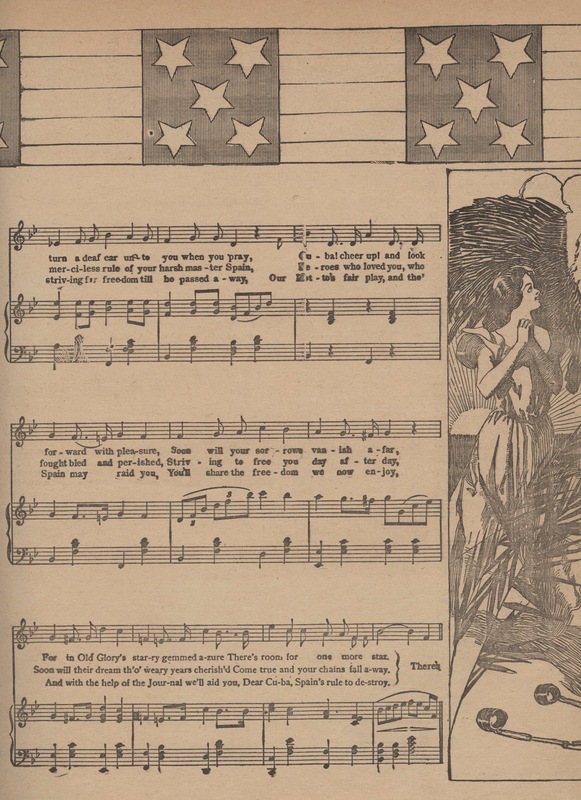 For in Old Glory’s starry gemmed azure, There’s room for one more star. Binding you tightly, a poor captive, under the merciless rule of your harsh master of Spain. Heroes who loved you, who fought bled and perished, striving to free you day after day. Soon will their dreams, through weary years cherished, come true and your chains fall away. Nobly you fight, ever resisting, taskmaster Spain who spares not to slay. Led by a hero ever persisting and striving for freedom ’til he passed away. Our motto is fair play and tho’ Spain may raid you, You’ll share the freedom we now enjoy. And, with the help of the Journal, we’ll aid you, dear Cuba, Spain’s rule to destroy.